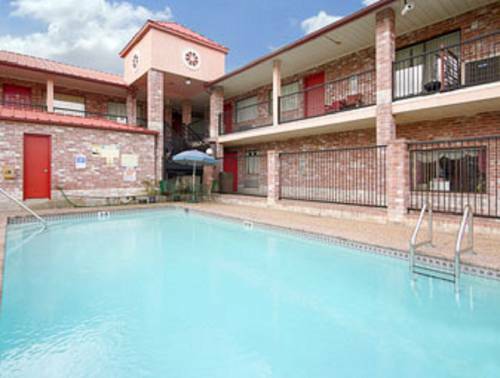 Stay at Travelodge San Antonio Downtown hotel near San Antonio International Airport. Amenities include complimentary breakfast, gym, pool, hot tub and business center. Rooms have complimentary wireless internet, desk, ironing facilities, microwave, fridge, TV, sitting area, as well as coffee and tea facilities. Attractions are Seaworld, Alamo Mission in San Antonio, Henry B. Gonzalez Convention Center, Tower of the Americas, Chart House Restaurant, McNay Art Museum, Alamodome, San Antonio Botanical Garden, San Antonio River Walk San Antonio Zoo, Splashtown San Antonio and Six Flags Fiesta Texas. Pets are welcome for a fee.